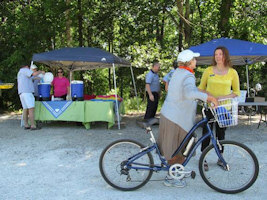 The Friends of High Bridge Trail State Park (FoHBTSP) actively participates in the mission of High Bridge Trail State Park. That mission is to conserve the natural, cultural, scenic, and recreational resources of the park, as well as to provide a variety of recreational and educational opportunities and to promote environmental stewardship. You too can become involved. 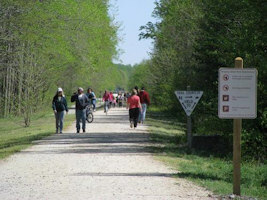 Centered between Cumberland, Nottoway and Prince Edward Counties, High Bridge Trail State Park is one of the newest additions to the family of Virginia State Parks. 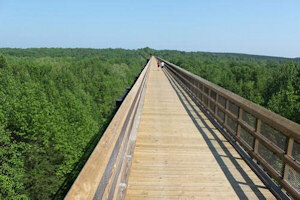 Opening in 2006, High Bridge Trail State Park boasts its very own historic landmark, a 2,400 feet long, 125 feet high rail road bridge rebuilt in 1914 which was donated by the Norfolk Southern railroad line. The bridge opened in 2012 which completed the 30 miles of trails now open to the public for hiking, biking, and horseback riding. As the park continues to be developed, new opportunities will arise to support the park in a variety of ways. One of those ways is through the Friends group. Friends groups are non-profit organizations that are formed to support a local park through volunteerism, advocacy and fundraising efforts. Anyone interested in becoming involved with Friends of High Bridge Trail State Park, please contact the Friends and ask for information on joining, annual membership, dues or donations. Dues and Donations are Tax Deductible. For additional information, e-mail fofhbt@gmail.com.